Here is a brief summary of the happenings of King Philip's War. For more information click on the bibliography page to locate some sources. King Philip’s War was actually a war fought between the Indians and the English settlers in New England, which took place for 1675-77. King Philip is the English name given to the Indian chief of most of the New England region. 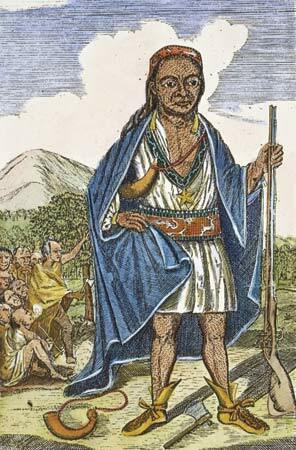 The Indians knew him by the names Metacom, Pometacom, and Metacomet. King Philip’s War started as a result of the actions of the English. The settlers were slowly expanding into Indian territory, depriving them of their hunting grounds and planting fields. The English had consistently being attempting to force their ways upon the natives. They attempted to do business and set treaties using British laws not understood by the Indians. Mainly, the settlers tried to convert the Indians into Christians. Eventually, many of the Indians grew frustrated and upset by the consistent pushing, and insulting of their ways of life. In 1675, the Indians frustration level reached a peak, and King Philip began plotting to drive the settlers away. However, the English got wind of the plot, so Philip had to alter his plans. The Indians started their attacks by shooting the settlers cattle and robbing their houses. Finally, on June 24, 1675 a settler in the town of Swansy, MA got so fed up with the tormenting from the Indians that he shot one of the natives. This action started the Indians shooting and King Philip’s War officially began. June 24, 1675 – official start of King Philip’s War. June 30th – Troops from Boston arrived in Swansy and proceeded to drive the Indians into the swampy woods, which caught the Indians by surprise causing them to flee into Rhode Island. July 18th –English troops entered the swamps in Pocasset, Rhode Island and attacked the Indians, who retreated farther into the swamp where the English couldn’t follow them, therefore they set guards to watch them instead. A few days later – The English tried to enter the Indians hiding place, but were ambushed. The English retreated to Brookfield. Philip’s army escaped from their guarded swamp to Rehobooth where they were discovered and English soldiers were sent out after them. August 1st – At dawn the English took the sleeping Indians by surprise and a battle ensued lasting until 9 am. The English coming out of the fight with few casualties than the Indians. September 1-3 – The Indians attacked the towns of Deerfield and Northfield. September 26th, and October 5th – The Indians tricked the English soldiers and attacked Springfield, MA. The English assumed the Indians would have moved on to Hadley. December 19th – With new, stronger forces the English stormed the Indians camp burning their wigwams and store-houses. February 10th – Needing to take a course of drastic action to keep spirits up, the Indians raided the town of Lancaster, MA. During this raid fifty townspeople were either killed or taken captive. Among them was Mrs. Mary Rowlandson and her three children. February 21st – A group of Indians attacked the town of Medfield where a company of English soldiers was stationed. The Indians were scarred off mid-attack by the firing of a canon. March 14th – The Indians attacked the town of Northampton, but the English were ready and the Indians sustained sever losses. March 26th – After a presumed, successful fight with the Indians in Rhode Island the previous day, the English pursued the Indian forces, and were led into an ambush. The entire English company perished as well as many of the Indians in this battle to the death. April – An Indian captive led the English in Connecticut to the hiding place of Canonchet, one of the leading Indians through the war. The English took the camp by surprise and executed Canonchet. This put a lot more effort of King Philip, and really hurt the Indian army. April 20-21 – The Indians tried to persist, so on April 20th they surrounded the town of Sudbury and hid. The next day after the English forces arrived in the town, the Indians attacked, and after a few hours the Indians dispersed to fight the English reinforcement that was on their way. May 2nd – On this day, John Hoar, at Redemption Rock, released Mary Rowlandson from captivity. May 18th – The English, in retaliation to a Indian attack upon cattle in Deerfield Meadows, ambushed the Indians at their camp and attacked them while they slept. However, Indians camps near by heard the shooting and attacked the English as they attempted to retreat. At this point the Indian tribes were losing confidence and were slowing breaking off from Philip’s leadership. July 2nd – The English moved down to the Narraganset area and came across a large group of Indian who they drove into the woods and took many of them captive. After the battle at Narraganset the English instructed the Indians to surrender, many did and they were immediately taken captive. August 12th – One of King Philip’s captured men led the English to Philip’s hiding place, where King Philip was then shot and killed. After Philip’s death his chief counselor surrendered his party to the English. Hostilities continued until September 19th, being the last recorded attack and the last time the Indians took captives for the purpose of the war.